This beautiful hotel should be on everyone's bucket list! The Burj al-Arab (Arabic: برج العرب‎‎, Tower of the Arabs) is a luxury hotel located in Dubai, United Arab Emirates. It is the third tallest hotel in the world; however, 39% of its total height is made up of non-occupiable space. Burj Al Arab stands on an artificial island 280 m (920 ft) from Jumeirah beach and is connected to the mainland by a private curving bridge. The shape of the structure is designed to mimic the sail of a ship. It has a helipad near the roof at a height of 210 m (689 ft) above ground. 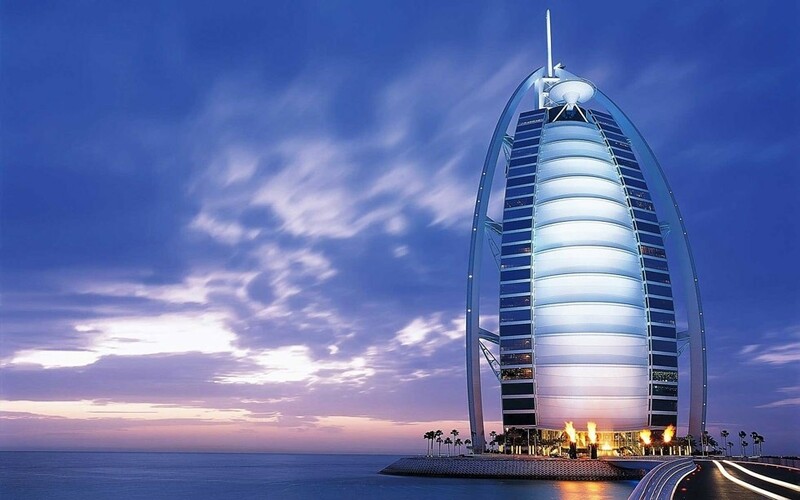 Yet for all the wonder this stunning structure provides when you finally see it in person, it is the service within that really makes the Burj Al Arab Jumeirah so extraordinary. Repeatedly voted the world's most luxurious hotel, this magnificent destination offers you the finest service and experiences throughout - right down to an optional chauffeur-driven Rolls-Royce, helicopter trips from an iconic helipad, private beach access, luxury leisure on a breathtaking terrace with pools and cabanas as well as some of the world’s best dining venues, including the highly acclaimed Nathan Outlaw at Al Mahara. The Burj Al Arab sets a new standard for hospitality superlatives, including an underwater aquarium restaurant that you reach through a simulated submarine voyage, a fleet of Rolls-Royces on the forecourt and the famous helipad that has hosted numerous celebrity stunts. Where else will your cappuccino be sprinkled with gold dust?